Naya Kang Peak Climbing is one of rewarding, exciting and empowering climbing experience in Himalaya with a stunning view of beautiful and remote mountains, fascinating Tibetan-influenced culture and untrammeled by masses of climbers. The peak features the astounding views of Langshisa Ri (6,370m), Pemthang Ri (6,836m), Shisapangma (8,099m), Langtang Lirung (7,425m), Pemthang Kapro Ri (6,830m) and Langtang II (6,836m) along with several other peaks. Naya Kang though not as high as other trekking peaks in Nepal is considered difficult because of the technical skill required for climbing this peak. Climbers must be in good physical condition and acquire positive attitude. They must possess the technical knowledge on using climbing gears like ice ax, ropes, crampons, ascender, descender and more. (Mid-September to December) and (March to May) is the best time of the year for launching the expedition to Naya Kang Peak climbing in Nepal. Naya Kang Peak 5,844m is the suitable choice for novice alpinist seeking for the introductory expedition to other challenging peaks. Tucked away far in Langtang region, Naya Kang Peak also known as Ganja La Chuli Peak lies in the lap of the perfect alpine landscape in the world. Langtang National Park is home to the dense forest of rhododendron, fir, blue and chir pine, oaks and birch. It also shelters highland wildlife that includes leopard, musk deer, Himalayan black bear, langur monkey and red panda. The normal route to climb Naya Kang Peak is via north-east ride over the line on ice and snow. We follow the main trail of Langtang and climb up to Kyangjin (3,749m) for the summit to Naya Kang. We halt for one day at Kyangjin Ri acclimatization purpose and climb several hills that command magnificent views. On the way to Kyangjin, Langtang valley opens up and one can witness the magnificent view of Langtang range soaring high above the skyline. From Kyangjin Ri, we cross Langtang Khola south of Kyangjn Gompa and climb high to Naya Kang Base Camp. We set camp at high camp and begin our climbing expedition from the north east-ridge. We trek back via the same route to Syabrubensi and join the overland journey to Kathmandu. If you wish, we can trek over the Ganja La Pass to Helambu. Himalayan Joy offers full board package for Naya Kang Peak Expedition including climbing permit from NMA and other essential logistics from the very day of arrival to your departure from Nepal. We also offer proper maps of the trekking and climbing route, expert cook, and his helper, an experienced and government licensed trekking and climbing Sherpa guide and porters, high-quality logistics and comfortable accommodation throughout the entire trip. After completion of your airport formalities, immigration and visa requirements, our airport representative will meet you outside the terminal hall. He will greet you and transfer to your hotel. In evening, attend welcome dinner, introduction to your trekking leader, briefing about the trek and check the necessities. After breakfast, our city guide will take you to various historical places and world heritage listed sites. These will include Pashupatinath (One of the greatest Hindu temples in Asia), Bouddhanath stupa (Buddhist stupa), Swayabhunath (Buddhist stupa, also known as the Monkey Temple) and Kathmandu Durbar Square (home of the living goddess Kumari)). After sightseeing, you will be dropped at your hotel with time to prepare for your expedition. After breakfast, we drive north of Kathmandu valley along the bank of Trishuli River and pass scenic foothills and ridgeline vistas to Dhunche. The first section of drive up to Trishuli Bazaar is quite smooth. The path further continues through gravel road to Dhunche. Today we begin our trek with leisurely walk through forests and terraced hill slopes. As we approach Syabru, we climb down to the ridgeline that divides the Langtang Khola from the Trishuli River. Syabru is picturesque village stretched out along the ridgeline. We continue walk through the Syabru village to reach our camp site located fifteen minures beyond the slopes below the village. If you wish, you can stay overnight at teahouse in Syabru Gaon. After breakfast, we continue walking along the ridgeline and then descend to Ghopche Khola (2050m). Next, we descend to Ghoche Khola (2050m) before making a gentle ascend to Rimche (2400m) through Bamboo (1960m). We end our trail at Lama Hotel. On the way, we encounter many highland wildlife including red panda, monkey and bears. After breakfast, we continue climbing with occasional view of Langtang Lirung between the trees. At Ghora Tabela (3,000m), the trail emerges from the forest. We encounter white monkeys and local birds. We visit the monastery shortly before arriving the village of Langtang, the headquarter of Langtang National Park. After breakfast, we climb uphill and cross sereral streams and moraines before entering into the settlement of Kyangjin. Here we explore small monastery and government-operated cheese factory. Stating early, we arrive Kyangjin Gompa by the lunch time. We have sufficient time to acclimatize and explore. 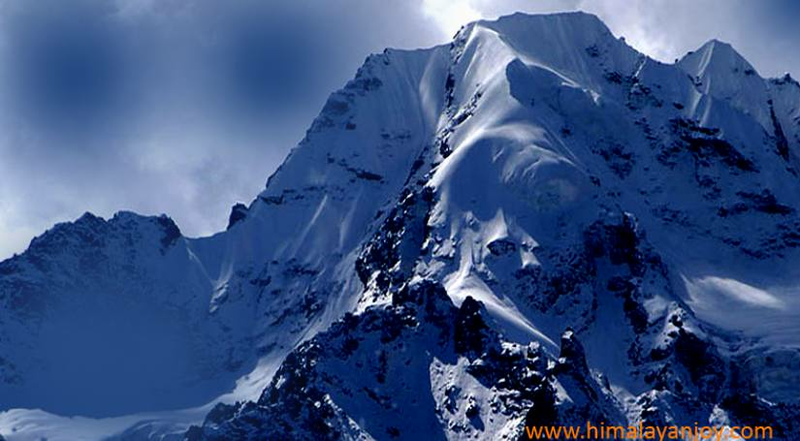 This picturesque place is located at dramatic site with magnificent Himalayan view. Dorkje Larpa (6990m), Langtang Peak (637m) and Langtang Lirung (7245m) are the several peaks seen from the village. Today we set a day side for acclimatization at Kyangjin Gompa. Here we visit monastery and cheese factory, climb the moraine to witness the glistering peaks and stunning glaciers or walk up to Kyangjin Ri (5000m). After breakfast, we descend for about twenty minute and cross the suspension bridge over Nyagang Kharka before making a climb to Nyengang Kharka. We walk along the juniper shrubs and enjoy the view of Langtang Lirung and Langtang Lirung Glacier. Today’s trail follows the steep route until High camp. The trail negotiates the rocky and icy glacier. Though it is strenuous, the amazing view of Langtang Lirung, Tresko Ri, Ganchenpo Peak, Kibgyu Ri, Yansi Tsenji Peak and other peaks compensates the trek. We make a summit to Naya Kang Peak and retrace our step back to Nyegang Kharka. One day is separated aside for any case of contingency. We use this day for summiting the Naya Kang Peak incase summiting peak is postponed due to unfavorable weather. Today, we continue trekking downward crossing several streams and moraines and reach Kyangjin Gompa. En route, we cross suspension bridge over Langtang Khola and ascend uphill for about twenty minutes to reach Kyangjin Gompa. From Kyangjin Gompa, we retrace our step back to Lama Hotel following the bank of Langtang Khola; cross Langtang village and Ghora Tabela. After lunch at Ghora Tabela, we make steep descend to Lama Hotel. The upper part of the trail is rewarded with great view of mountain and verdant hills. Today, we walk through beautiful Tamang and Sherpa settlement. We make gradual descend for first half of the trail and further make steep descend to reach Syabru Besi (1600m). Here we explore CHilime Power Plant and villages that have been influenced by Tibetan lifestyle. After breakfast, we drive through the winding road admiring the beautiful scenery of emerald hills, countryside villages, rivers and terraced fields to reach Kathmandu. After hotel check in and refreshment, we attend farewell dinner organized by Himalayan Joy in typical Nepali restaurant. Your 17 day Naya Kang Peak Climbing expedition comes to an end today. The representative from Himalayan Joy will drop you back to Tribhuvan International Airport for your final departure. Every day the world is facing a big issue of environmental pollution and in Nepal as well. Our field staffs are quite conscious about environmental pollution at any time and we encourage all. We would suggest to our guest to use boiled water or water purification pills than buying a bottle of water, it helps to avoid plastic bottles which can take long time to disappear. During the trek, if possible you can order same items food in a group which minimizes the fuel used and to make the campfire is almost forbidden. We would encourage being a responsible traveler so, just leaving foot-print on the trail and bring out all non-biodegradable which you had.